ellehermansen: My New Ride! Officially Part of the MINI World!!! This is basically the first time I have ever owned a car, not counting the Smart car we had back in Norway - because it wasn't really my own. 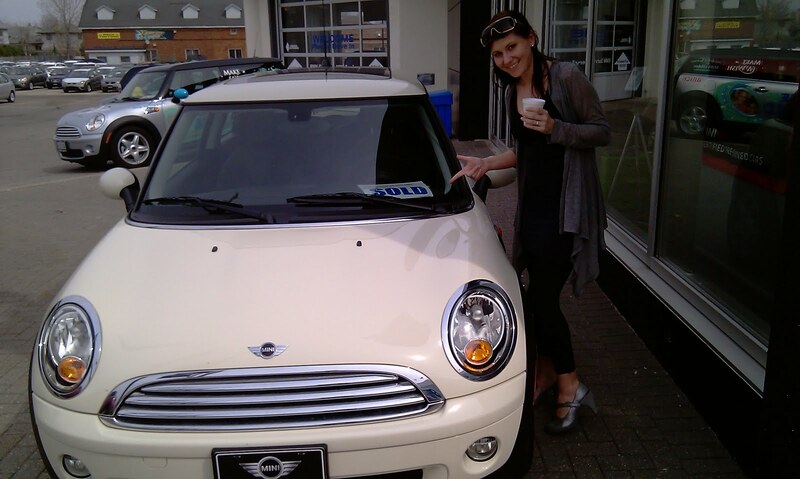 One of my life-long car dreams came true when I officially became a part of the Mini World, as I got to buy a brand new Mini Cooper and drove it home yesterday! I just have just a cell phone picture, as it was too rainy to take a picture today. The drive is amazing; it hugs the road while I sit very comfortably. It's also spacious, while still giving me the impression of driving a very sporty car. Although these cars are made in Birmingham, UK, the insides are that of BMW. What I love about this car is that I can really feel the road and my surroundings. I am truly blessed to have the opportunity to own such a sweet ride! 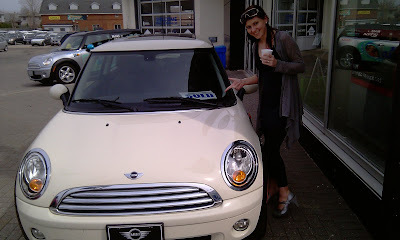 I want to give a shout out to Ron at BMW Mini in London, Ontario, as he was the best salesman anyone could ever ask for! I picked up the car with a wonderful gift basket complete in the boot of the car. It really made my rainy day! One of the many things I love about the inside is the panoramic windows, so I see lots of sky. They both open, which is also nice! The car has the ISOfix connectors for easy clip-in-and-out for a baby seat in the back - which surpisingly has amazing room. All in all I am very happy with this purchase and if you are thinking of a Mini Cooper, I say go for it! You'll love the ride! Cool ride! And nice choice for a first car! 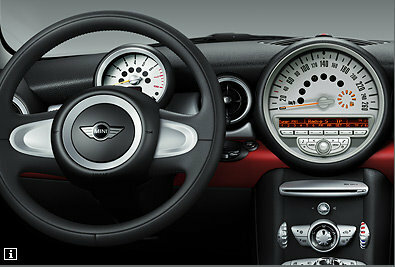 Minis are an embodiment of speed and elegance. If you have watched the movie “The Italian Job”, where they used Minis as their getaway cars, you will understand what I mean.